Sometimes, looking at the sky to the sound of a flying plane, you can see a long cloud trail, which stretches for flying machine. This track is called condensation, and consists of fog, which on the background of blue sky appears white. 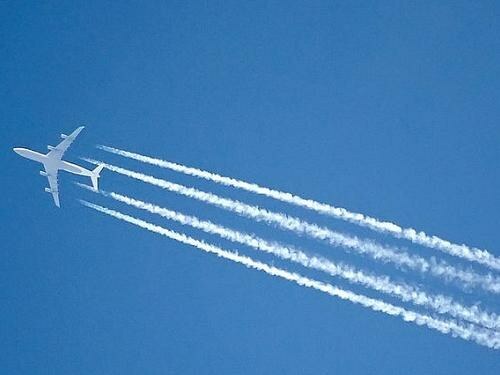 The trail leaves flying plane, is called condensation. This name is derived from the origin of the track, which consists of condensed moisture produced when entering the atmosphere of water vapour from the exhaust of the engine. Thus, the strip after the point in the sky is nothing, like a fog.What is the reason for the occurrence of this fog? During operation, the engine throws out the exhaust gases that are formed during the combustion of fuel. These gases – coupling water and carbon dioxide. The water contained in the exhaust in the form of steam, therefore, has a high temperature. The temperature of the ambient air at high altitude is very low, so water vapor is quickly cooled and soon congenerous, moving into a phase of fog.If atmospheric air is dry, i.e. its relative humidity is minimal, the trail dissipates very quickly and the eye remains invisible. If the humidity is high, the strip remains for a long time. Moreover, if the air is saturated with moisture, condensed from the exhaust gas water not only persists, but increases in volume and eventually becomes part of Cirrus clouds.Aircraft in flight, overcome large distances, so part of the condensation trail in the formation of clouds affects the climate. Cirrus clouds keep heat on the planet, thus further contributing to their increase may contribute to the acceleration of global warming. And when you consider how fast on Earth is developing the aircraft and how flight occurs daily, you can imagine how big this contribution is. It is possible to avoid large-scale impact on the climate by requiring pilots to move to a lower altitude or to avoid places with high relative humidity, but it will reduce the speed of flight, and accordingly will increase their number, which in turn will lead to increased carbon emissions into the atmosphere. Therefore, the problem of harmful effects of this atmospheric phenomenon on the climate remains unresolved.